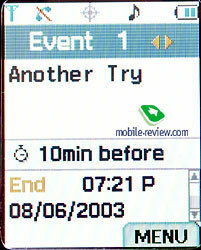 The first-rate companies frequently date the release of small batch of phones for this or that event. The differences from serial models, as a rule, are in changed software, other case colors, and some elements of appearance. Such models became rather widespread, though suggest some exclusive for consumers. But it's quite another matter, when the manufacturers use product placement. By this term mean the placement of different goods in potentially popular movie, the result is the big interest to this product. Sometimes, especially in fantastic movies, is advertised not real product, but prototype. But there's the company's name on it, it is game of image. It's unreal to buy such prototypes, as consequence, interest of spectators has only the speculative character. Another way has followed Samsung Company, and its experience is something unique. After sensational movie the Matrix it became clear, that the continuation is doomed for success. 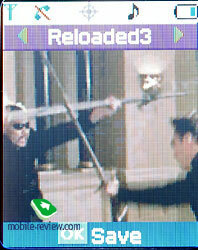 During the second and the third part shootings have been completed product placement agreements (hidden advertising) with several companies, but most well it has made Samsung. Long before movie release, the company has used symbolics in its promotional materials. Simultaneously has been gambled on the individual phone model creation, especially for movie shootings. It is necessary to emphasize, that the company initially was guided by sales of this model, instead of plaster cast creation. As against other serial models this device has been released in limited quantity and besides its own serial number (SPH-N270) has received also the own name - Matrix Phone. 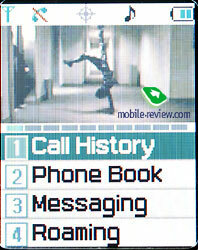 The phone is shown in the movie only twice, the majority of spectators don't pay attention to it. But due to the sensation around this project, the model became well known among the potential consumers. The interest was also generated by the fact, that the phone is released only for USA market and officially is in sale only there (CDMA/AMPS).It follows that, in the menu it is possible to find only English and Spanish languages. The beginning of sales has been dated for movie's premiere, during two weeks all the circulation (this word is more appropriate here) was sold. At the official device's site, is spoken, that, probably, would be released the additional batch of devices, and you can make advance order there. Not only the appearance emphasizes the device uniqueness, but also the metal plate placed at the top end face. There's the serial number on it (5 numbers), in the case of mine it was MTX01017. Phone is produce only in one color of case - black. It is entirely made of plastic, the size in the pile up state makes 113х62х20 mm. The device's weight is 132 grammes, but it doesn’t seem heavy and lies well in hand. 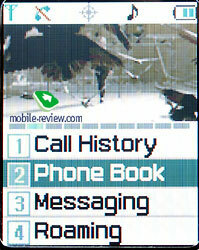 To open phone it is possible, having pressed the side keys, then the top part is "shot" upwards on metal rails. 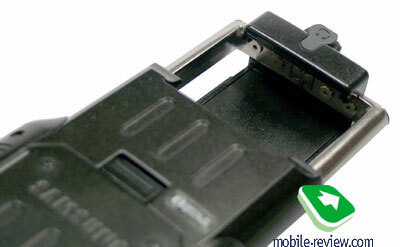 To pile up the device it is possible, having shifted the top part down to click. 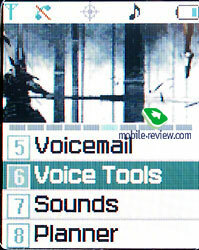 It is pleasant, that you can adjust different sound for device's opening, in particular, characteristic clicks. The open device has backlash, it is felt when you move the top part. The backlash doesn't affect the serviceability in any way, it is design feature. When you carry the phone in pocket, it is necessary switch on the opening mechanism lock, otherwise the phone will open by pure accident. To lock it is enough moving the slider on the back side of the device. 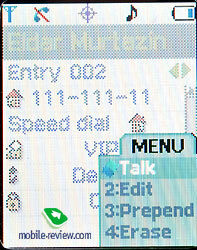 In the closed state is visible the part of screen, different information can be displayed on it: base station signal, date and time, battery charge. 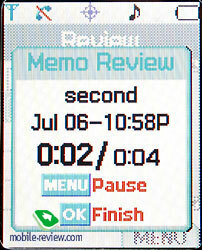 The screen does not work the most part of time, you can switch in on, having pressed the OK button. 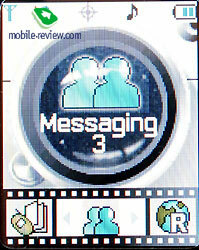 The screen is also activated at incoming call, message or event. This is made with the certain intention, as the visible part of the screen can't work separately from the whole matrix, this results in increased power consumption. 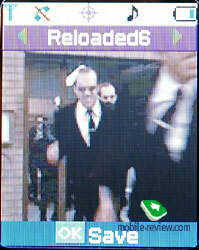 In the closed state the information is displayed in matrix style, green font and black background. 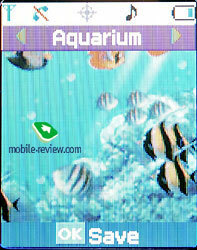 Having opened the device, you will see, that the screen is enough big (28х34 mm), its resolution makes 128х160 pixels. It allows displaying up to 6 text lines, service line and menu headings. 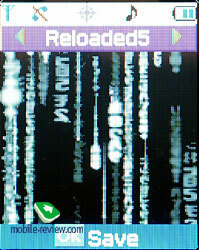 The screen displays up to 65000 colors, from the behaviour on the sun (the picture fades, but it is visible) it is TFT-matrix. Because the screen is sunk in the case, the picture is better visible, than in other models. It's necessary to note, that in photos the screen looks worse, than in life. The keyboard is made of plastic, the keys are rather big and well moved off each other. The backlight is of green color, it's bright, and it is visible in various conditions. 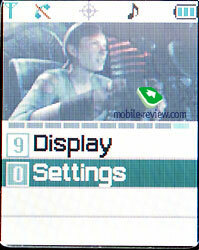 There's joystick under the screen, it not only allows moving through vertical menus, but also reacts to pressing. 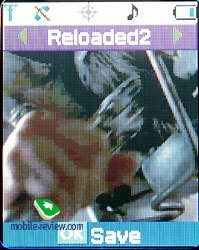 The exit to top level of the menu is realized by Back key. There's system connector on the bottom end face of the device (data synchronization, but the cable isn't in sale yet),right here is the charge connector (it differs from serial connectors). You can see the handsfree connector on the top of back panel, it is covered with rubber bibb. The accumulator is a part of the back panel. The lithium - ionic battery in capacity of 1000 mAh is installed in this device. 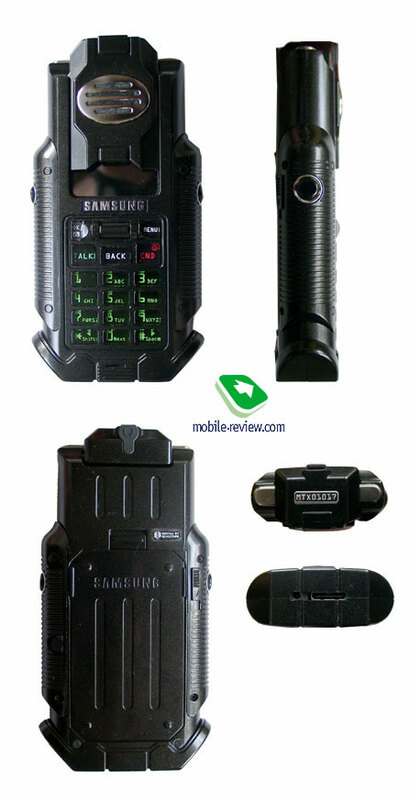 The device is capable to work up to 3 days at 25-30 minutes of talking and minimal use of other functions. The time of the full charge makes about 2 hours. The only thing which is needed to be mentioned, is speaker design feature. It's not big, and it's located on the sliding part. As a result, the 40-tone polyphony, which is played with its help, sounds a bit quietly. 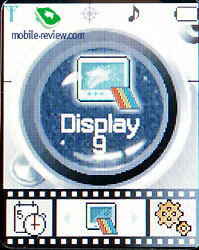 The sound level is comparable with European models (Siemens S55, Sony Ericsson T610), but differs from Samsung models. 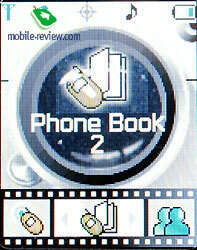 Menu also emphasizes, that the phone is created for movie and by its motives. Every menu item (Matrix style) has each small, animated fragment from movie, it is looked extremely unusually and attractively. 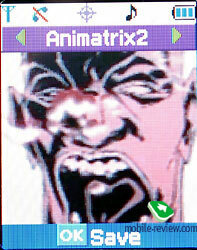 The Animatrix menu style is also available, here all is simpler, but animation is also present. 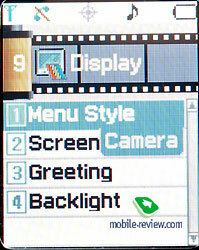 The most simple menu style is named Camera, each item disappears behind the objective's diaphragm. 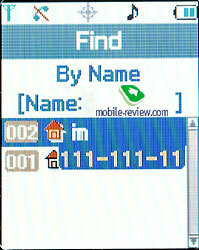 The subitems are realized as lists, there is fast navigation with the help of shortcut numbers. Let's take up the basic menu items and provisions. Call history. 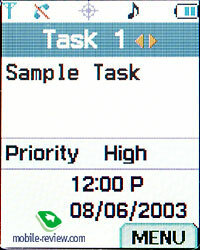 There are three lists for received, dialed and missed calls, can be stored up to 20 records in each, there is time and date label. You can't look the duration of all calls in this menu. Телефонная книга. It's possible to save up to 300 names in the device's memory. To 1 one entry you can enter 4 phone numbers, e-mail address, URL, birthday, note, personal melody, voice label, you can also specify group. To each name corresponds one of the preinstalled pictures, it was not possible to understand, whether you can load images or not. 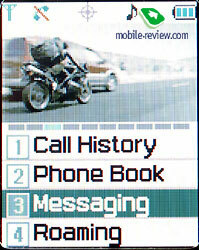 In the phonebook there is search by subscriber's name, record number, group. Сообщения. All opportunities follow from the name of the menu. Roaming. In this menu you can adjust roaming settings, nothing especial. 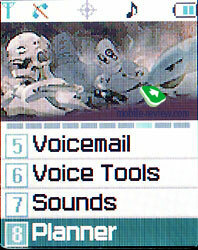 Voice Tools. Against a background of other models, this device offers innovations in the field of working with voice. So, long pressing on Talk key will pop up the menu with various items, two most interesting of them are Digit Dial and Name Dial. There is no necessity to enter voice labels for individual names in this phone, it is enough to activate voice dial and to pronounce «Name Dial», and then after voice invitation you have to pronounce the name of called person. The phone will compare the name with entries in phonebook and having found the conformity, will read the name, then will ask to confirm the dial. If you answer "Yes", the device will make the call. The sequence doesn't seem to be fast and convenient, but in real life it speeds up the dialing process. Frankly speaking, I got used to this system for couple of days and I didn't want to use hand dial. The dial by individual numbers is also possible, here is the same principle, plus you can set up the dialing system for your voice features. For this purpose it is necessary to dictate all numbers, the system will remember them, and further will dial the number starting from these values. The fine tuning is not required for the usual American man, the system works well even in noisy conditions. The development of such dial belongs to Voice Signal company. 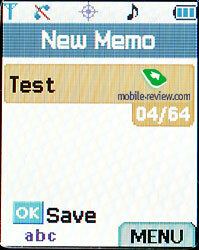 It is necessary to note, that by simple commands you also can call organizer, settings menu, phonebook. Here is one more curious opportunity, having called the phonebook you can find the necessary entry, having pronounced the person's name. It's conveniently in case when you have a lot of familiar and friends. The system of recognition works pretty good in conditions of bustling street, there are no any problems. Last stroke which characterizes this device - the help for voice dial which represents dictaphone record for one minute. To listen to such record is more convenient, than reading the text on the rather small screen, constantly scrolling it. 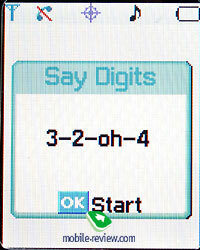 The user can also make voice notes, instructions (length - up to one minute). Such records can be used for names, further they can be deleted or renamed. Sounds. As follows it from the name, here are all the adjustments related to sound. 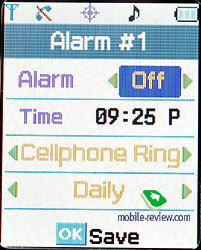 First, alert types for incoming call, message, and alarm clock. To find vibration alert at once will fail, it is adjusted, if you will choose the maximal ring tone loudness and will move the slider further. 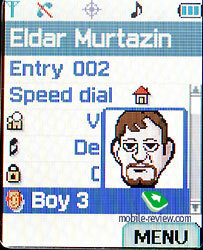 In the mixed mode the device can work only for incoming calls. The amount of melodies is not so great, a bit less that 20. Some melodies from movie, in particular, two voice tracks. Frankly speaking, that the set is not the best (in my opinion), but it is perfectly blended with the device concept. Planner. In the organizer you see calendar for month, you can adjust various events for different days, specify alert types for them and other. Unfortunately, the memory size allocated for such notes, is unknown, but it's rather big. There is individual to do list, the opportunity to enter notes (up to 64 symbols each). There are 3 alarm clocks in the device, each can be adjusted to single or daily operation. 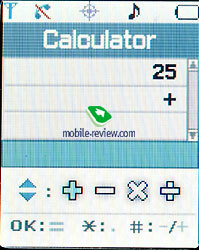 The calculator is convenient enough and realizes the utilitarian function. 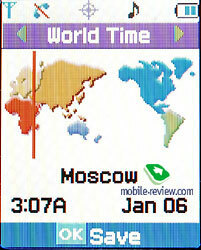 The world time function is traditional for Samsung phones. Display. 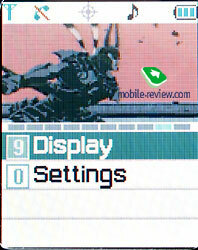 Here are all display adjustments, in particular, menu style choice (Matrix, AniMatrix, Camera). There is a set of more than 10 animated screensavers, they also are made by movie and cartoon motives. 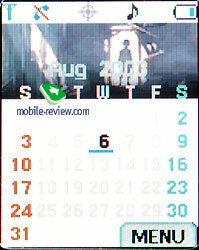 Plus there's an opportunity to set up digital clock or calendar on the screen. 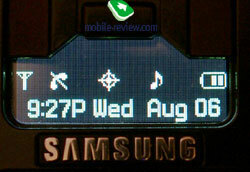 The setting of backlight (screen and keyboard) operating time is interesting. They can be adjusted separately, this is logical, but, nevertheless, is realized in small amount of devices. Settings. From all adjustments it is necessary to note the phone lock by user password, and switching on/off of transmitting location feature. The last one has appeared in this device for conformity to E911initiative, widespread in USA. As you saw from photos, my device has not been registered in network. 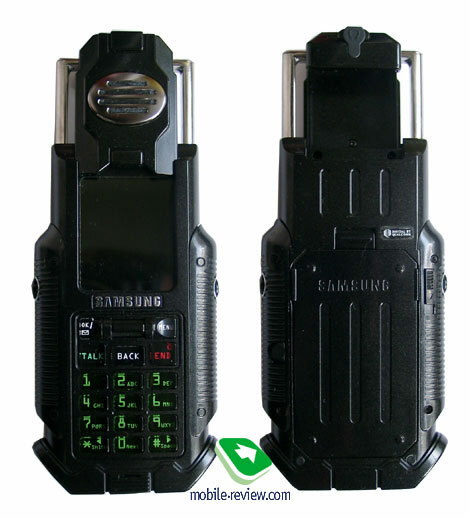 But its work is possible in Moscow (Sonet), and there are some people in Moscow, which use this phone. It was possible to find one of them and to find out about the quality of speech transfer. According to his words the device works well. The operating time makes about 3 days (it is specified in the first part of the review). The loudness of ring tones is not always enough in the street, there are no any problems in car and rooms. The vibrating alert is weak, the case jingles during it. It's impossible to speak that this device will be widely distributed, its circulation is too insignificant. 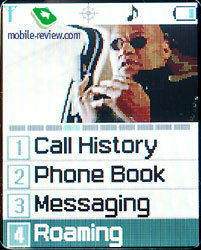 Basic users of Samsung Matrix Phone are in America, in the network of Sprint PCS. As it has been already spoken, it's impossible to find this device in sale now. The obsolescence period is small enough, only 4-6 months, i.e. during the time while the movie is popular and widely discussed. Further the device will be cognate, but it won't cause so much interest. To speak about the price is impossible, as it is a rarity already now. There is no Java support in the device, because it is intended for the American market. The absence of built-in games it's quite another matter, the developers have thought, that the device is a toy, and have not provided any additional entertainments. The phone is standard technologically, it marks out only by the form, the internal filling stylized to movie, and the newest voice recognition system. It is necessary to expect the occurrence of such system already in the near future in other serial devices from Samsung. To aspire possessing such device doesn't worth, it is image decision, and besides it's not too durable, the interest to it will quickly disappear. Samsung has offered the new decision from a position of marketing, and as practice has shown, successful. Therefore it is necessary to expect, that the occurrence of similar products with the limited circulations becomes habitual business in the near future.